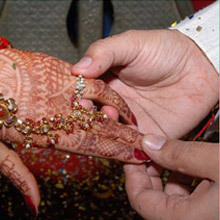 Engagement is a step closer to getting married which on its account is a huge decision, given the numerous factors that involves wedding. A whole new realm of love and excitement lingers all around. Several admitted that it is one of the most golden periods in one's life. You can come up with unique ideas to give your relationship a new vibrant feeling. Here are some things you can try your hand on to sustain that amusing feeling. The period after engagement, in case of an arranged marriage, is the most opportune time to learn more about the person whom you would want to be more like a best friend than just being a partner. So, seek time and make an effort to establish that mutual connection with your spouse. It would be smart and beneficial to not talk about past affairs at this point of time, especially when the love between the new couple is trying to bloom. Planning a big marriage is a long nourished dream for every woman. Planning details with your fiancée about how the celebrations would unfold on the big wedding day; will definitely provide the best opportunity to share and understand each other's point of view.